Soon after opening its doors in 1999 as a professional window washing and cleaning business, Crystal Clear Window Washing, Inc. began to offer many additional services, such as our outstanding pressure washing and power washing. And since adding those services, our mission has always been to provide our Chicagoland customers with the most reliable and affordable power washing. 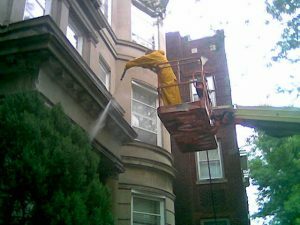 Today, Crystal Clear as one of Chicago’s leading power washing companies, we have the highly-skilled staff to back up our remarkable reputation. Everyone on our power washing team is expertly-trained and has years of experience dealing with a variety of power washing situations. Customer satisfaction is always our goal! That is why we won’t leave your premises until you are completely satisfied with our pressure washing job. We personally guarantee our work. Also for your protection, Crystal Clear carries full-liability insurance, and each of our employees is bonded. Crystal Clear will help make your old deck, patio, porch, siding etc. shine like new. After a visit from the professionals at Crystal Clear, we are sure that you will never worry about your home’s pressure washing needs again. We will take care of everything for you! At Crystal Clear, power washing is our specialty. This is why many homeowners come to us to schedule our seasonal pressure washing services. Pressure washing allows us to apply a strong force of water pressure to exterior surfaces in order to get them clean. There are a number of benefits to this type of cleaning. In normal cleaning, you have to scrub the surface to loosen and remove debris. Applying what is often called “elbow grease” to a cleaning project, especially on a large outdoor surface like a driveway, can often be exhausting, difficult and horribly time-consuming. In the capable hands of the experts at Crystal Clear, power or pressure washing allows us simply apply the force of the water to the surface without any extra effort required. It also takes a lot more time for someone to prepare a cleaning solution and meticulously scrub down the area. Power washing is also safer than having to use a ladder to clean siding. Furthermore, there are environmental benefits. When the pros at Crystal Clear use a pressure washer, they usually do not have to use a cleaning solution to get the job done. The force of the water is enough to remove most dirt from a surface. As a result, the toxic chemicals in the cleaning solutions do not run into storm drains and streets or onto your lawn. This prevents the toxins from entering the environment. With Crystal Clear, pressure washing your home is easy as can be. Just leave it to our pressure washing professionals. They will take care of everything for you, from estimating the pressure washing costs to the cleanup afterwards. Whatever you need pressure washed; we’ve got your covered. Our experienced team have the skill, know-how, and tools to handle all of your home or business’s pressure washing needs. With Crystal Clear’s pressure washing, you will save on both, time and money! Call us today to schedule your next pressure washing appointment. Our power washing specialists are standing by!